This Atalanta vs Empoli game was a rather bizarre one from Italy last night. Atalanta dominated the fixture in all aspects, but somehow failed to find the back of the net. 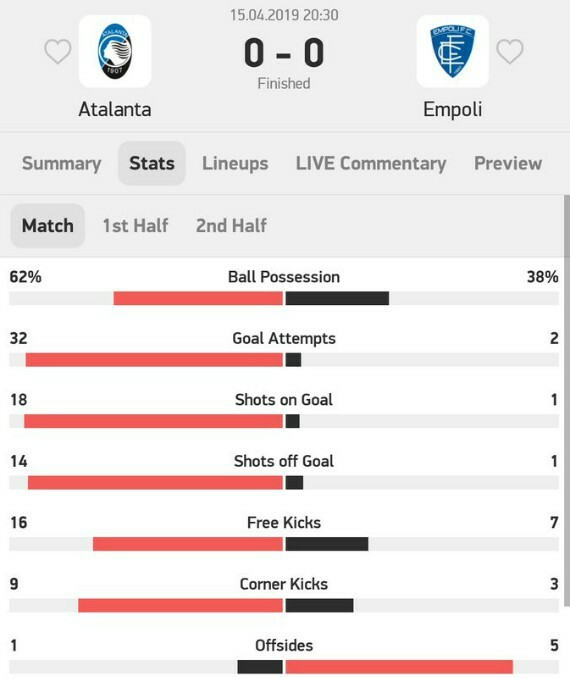 At a xG (expected goals) total of 6.03 for Atalanta (Empoli’s xG was 0.23, which meant this game should’ve ended 6-0), this is the highest score for a team in the xG stat without scoring! Atalanta had 32 attempts (18 of them were on goal), but the game still ended 0-0. Since detailed data began to be kept in the 2004/05 season, the 17 saves made by Empoli keeper Bartlomiej Dragowski against the Orobici is a record in Serie A.